For the batter simply mix together 1.5 cups of yellow corn meal, 1.5 cups of all purpose flour, 1/2 teaspoon salt, 1/8 teaspoon ground white pepper, 1/2 cup sugar (reduce this a bit if you want it blander), 2 Tablespoons baking powder, 1 teaspoon of paprika. In a separate bowl, whisk together 2 eggs and 1.5 cups of whole milk. Mix wet and dry ingredients until just combined, a few lumps are okay. Place the batter in a tall glass, I used a beer glass, and skewer your hotdogs with a barbecue stick (soaked in water previously) and dip them into the batter and jiggle up and down and carefully put into a deep-fryer or wok with hot vegetable oil on medium high heat. Oh Wow! Always wanted to try this… Thanks MM! Hi MM, where can I buy cornmeal? Thanks for the tip on using beer glass. 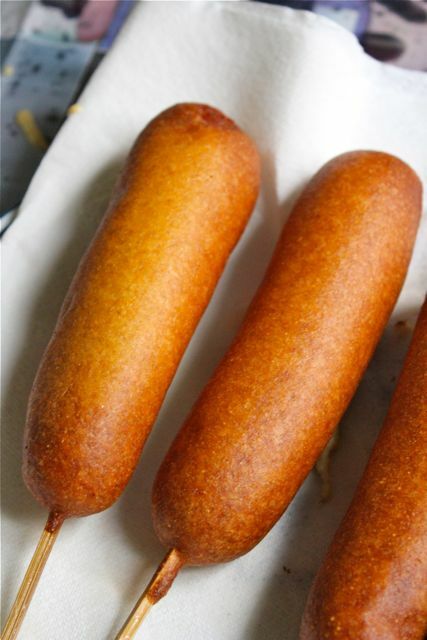 Corndogs…my comfort food, melts away my worries after indulging on this. This is my son’s fave but we always buy the ones in S&R or Salcedo Market. I will give this a try. Thanks! Gigi, cornmeal from Metro Grocery’s or Healthy Options. I suspect fine polenta would work as well. 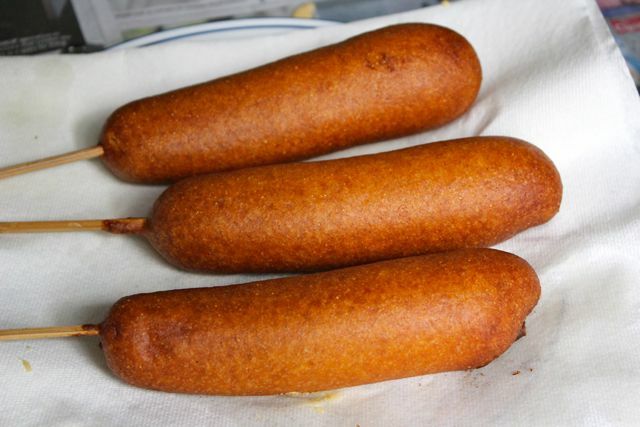 The cornmeal gives the batter that slight grittiness that is characteristic of a true corn dog… Other folks get snazzy and add chopped up corn kernels to the batter. millet you’re a genius! Will try your version as I only need to work with two ingredients, reducing the risk of disaster (am an aspiring chef but still stuck with cooking eggs as of the moment). Same as millet, when we were kids my mom used to cook corndog using pancake batter and red hotdog. this is taking me back from mall days with my mom. thank you! 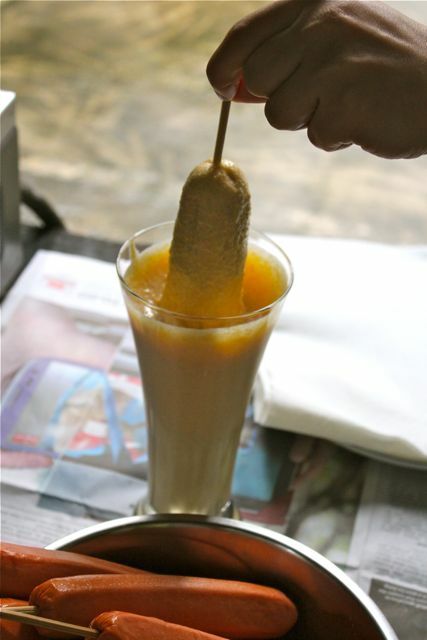 Yes memories….hotdog on a stick …..
Will definitely try this one. This will be lovely. I like octopus, lamb and boiled meat as much as the next guy, but a corn dog will make me swoon. I loved this as a kid…but couldn’t have it as much as I wanted. I only have white corn meal and don’t really eat hotdogs anymore but those red hotdogs scare me. Tks for the recipe. Do you need to pre-cook (by boiling, I guess) the hotdogs first? wow! This is my fav since childhood. Whenever I see one, I can’t resist it. Wow! very timely MM, I have a bag of corn meal in the pantry with nothing to use it for. Maybe this will be my merienda tomorrow.Happy weekend everyone! For those looking for yellow cornmeal, they also have in landmark trinoma. It’s at the aisle for baking/breads, beside the flour and cornstarch varieties. 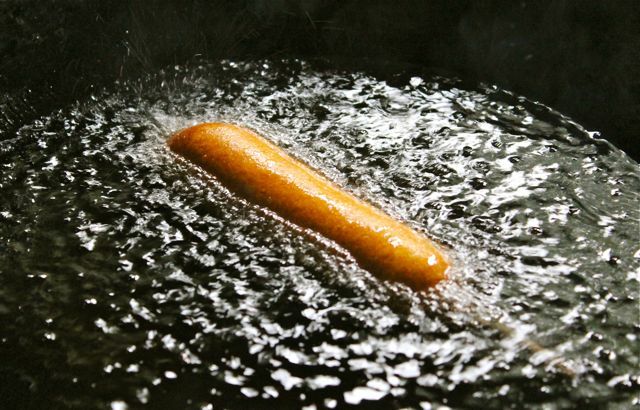 Thanks for sharing this easy corn dog recipe! Will have to look for some cornmeal and try them this weekend. I think my daughter will like it! I found imported US cornmeal at Hi-Top (Quezon Ave and Anonas) when I was living in Manila a couple of years ago. PhP 95.00 / 500 grams in a box. I have cut my hot dogs in bite sized pieces to make it easier for me! These are delicious!! How about if you don’t have yellow corn meal? Are there any substitute for that? :) Thank you!